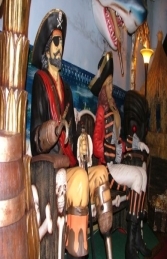 Our very popular Lady Pirate is now available as a seated Figure, she could be placed on a chair or barrel, but is a perfect combination with our Pirate Bench (JR 2447-B). This fantastically detailed life-size 3d model of a Seated Lady Pirate retains all the charms off the standing figure, the detail of her modelling is superb, she rests one hand on the arm of the Pirate Bench (JR 2447-B) and the other hand has a hook. The Lady Pirate sat on our Pirate Bench is ideal for adventure golf courses, theme parks, themed restaurants and bars, shop premises, cruise ships, any attractions, boat rides or even your own home! The list is endless! She would just look great anywhere.